1. Always gain permission to go on to a site that you wish to conduct a ghost hunt on. 2. Visit the site during the day first, and use hazard tape you pick up from a good hardware store to rope off anywhere that may have suspect footing or is a potential accident waiting to happen. 3. Have everyone meet near the location and decide who will work each piece of equipment - cameras, sound, video cameras and so forth. Divide up into teams if you need to. Pick a person or leader that will talk to anyone who comes in contact with the group (for example, Police, Reporters and so forth.) Be mindful of the living and the dead - don't create a racket and make a pest of yourselves. 4. Enter the site, and either privately or as a group ask for blessing or protection for the duration of the hunt. You can use this time to put yourself in a positive frame of mind. It does not have to be a religious thing, so everyone can do this in some way. I would encourage everyone to take the 10 seconds it takes and do it. What can it hurt? It's better to be safe than sorry. Experienced ghost hunting groups believe that there are evil spirits in many areas such as cemeteries. By saying a 10 second prayer, or making sure you are in a positive frame of mind, you can safely go about your business without worrying about that. In a situation like this, the energy you project is actually a really important form of self defence. A demonologist will tell you that by doing this in the name of God or whatever good deity you worship, you will keep any non-human spirits at bay since they have to leave you alone when told so in this manner. 5. 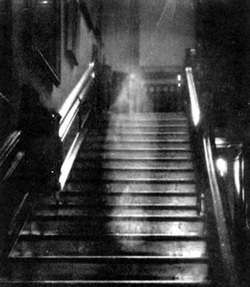 Walk around the area to get a feel for the surroundings and allow the spirits to get a feel for you. Do this for about 20 minutes. Log in things like time, weather and any other relevant information. Set up any stationary equipment like cameras on tripods, or motion detectors. Make note of any areas that might cause false readings or false positive pictures. 6. Get some pictures and recordings. Note anything unusual that happens. Particularly meter and temperature readings, sightings and any strange sounds. Take notes of any feelings or emotions you feel, that may be odd or out of place. You can compare notes with other members of the team after the hunt. Look for similarities in readings and feeling in certain areas, or at certain times. Patterns may emerge. 7. Do not stay in one spot for the entire time. Rotate a few times to different parts of the site during the investigation. This keeps every one fresh and at attention. 8. When you are done, get everyone to meet in one spot. Ask the human spirits here not to follow you home and to remain here. Tell the others that they must remain here in the name of God (or other good deities). Remember, this takes 4 seconds, it is simple and it will save you some problems down the road. If I am wrong about these prayer rituals at the beginning and end of the hunt, and they prove to not be necessary, then you wasted 14 seconds of your time. If I am right about them, you will have saved yourself from a lot of problems and grief that you do not need.